For the fourth calendar quarter, Samsung shipped an estimated 70.4 million handsets to take an 18.7 percent share of the market. The performance was down 5.5 percent year-over-year, but enough to steal the holiday limelight from industry rival Apple. Apple shipped 68.4 million iPhones during the same period, down 11.5 percent from 77.3 million in the year ago quarter, IDC said. The Cupertino tech giant's marketshare stood at 18.2 percent, down from 19.6 percent in 2017. IDC's figures are in the ballpark of findings from Strategy Analytics, which on Tuesday estimated Apple to have shipped 65.9 million units during the three months ending in December. As detailed during Apple's earnings conference call on Tuesday, and previously announced in a rare revenue guidance correction earlier in January, iPhone sales contracted in latter half of 2018 due in large part to an economic slowdown in China. Outlined in the company's earnings report, net sales in the region dropped from $18 billion to $13.17 billion, or a decline of 26.7 percent, on a year-over-year basis. As a result of Apple's diminished position in China, the company experienced its first combined revenue and profit decline since iPhone debuted in 2007. 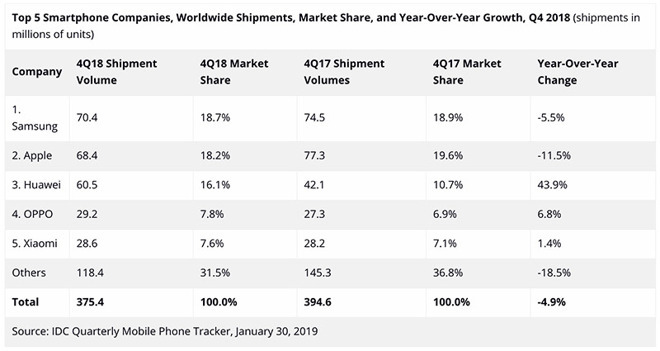 Of the top-five vendors, Huawei saw the biggest gains in the last quarter of 2018, jumping from 42.1 million units shipped in 2017 to 60.5 million units in December. The Chinese company, which was recently hit with criminal charges from the U.S. Department of Justice, managed a 16.1 percent share of the global smartphone market, up from 10.7 percent at the end of 2017. Rounding out the top five on IDC's list are Oppo and Xiaomi, which shipped a respective 29.2 million and 28.6 million units in quarter four. Overall, the global smartphone market continued to reel from economic headwinds. "Globally the smartphone market is a mess right now," said Ryan Reith, vice president of IDC Worldwide Mobile Device Trackers. "Outside of a handful of high-growth markets like India, Indonesia, Korea, and Vietnam, we did not see a lot of positive activity in 2018. We believe several factors are at play here, including lengthening replacement cycles, increasing penetration levels in many large markets, political and economic uncertainty, and growing consumer frustration around continuously rising price points." In response to sluggish iPhone sales, Apple CEO Tim Cook said the company is rethinking handset pricing in certain international markets. Currently, iPhone prices are based on the U.S. dollar, but that could change as the company looks to bring down out-the-door costs in a bid to goose sales.